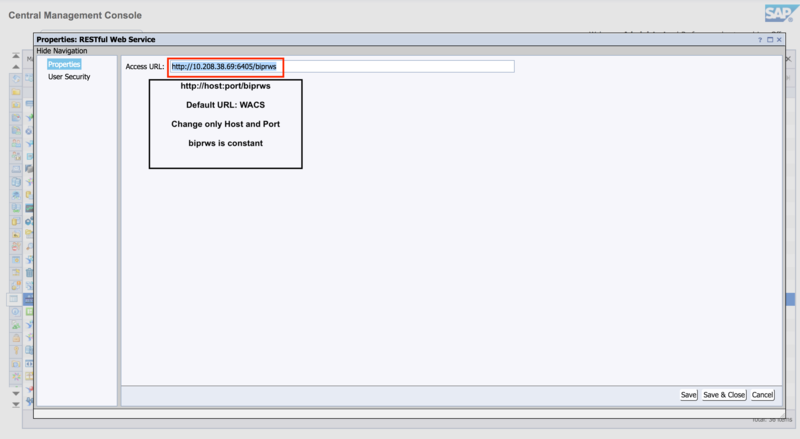 BOE 4.2 SP04 BI Platform REST Webservices deployment supports only WACS (Web Application Container Server). <host> – the name of the web server for BI platform. <port> – the port number for the platform. 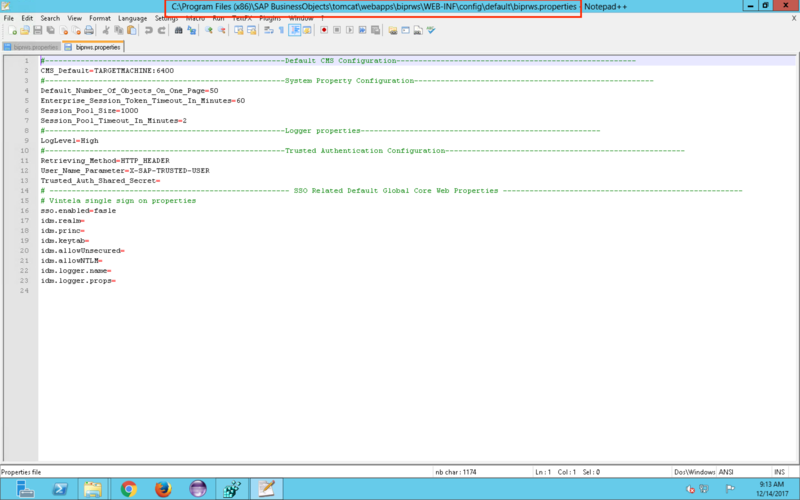 Version1 of biprws is introduced in 4.2SP03. Fiorified BI Launchpad completely depends on REST SDK. why to set REST URL in CMC? 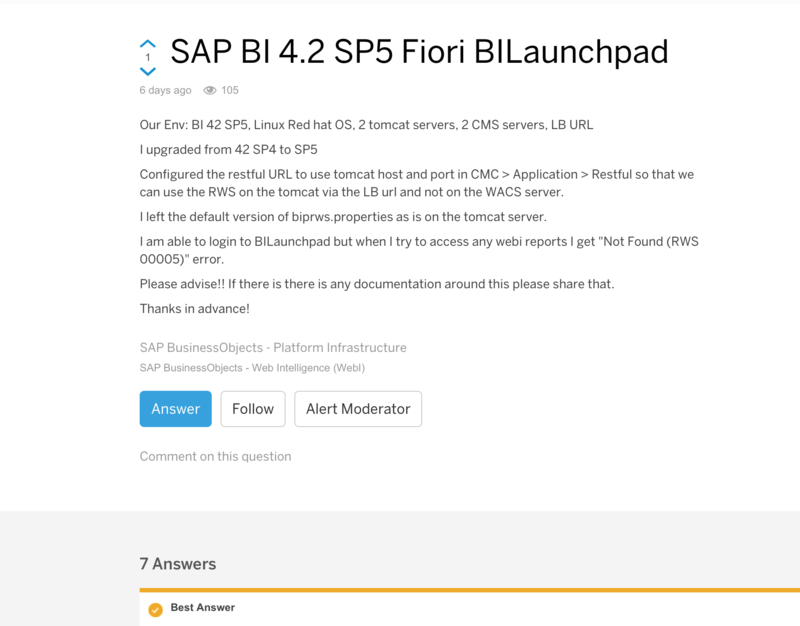 Answer : The REST SDK URL mentioned in CMC will be used by Fiorified BI Launchpad. How to set REST URL in CMC? Answer: Navigate in CMC Applications -> RESTful Webservices -> Right click and select properties and Change the URL. BI Platform REST services will be deployed as webapp in web server (tomcat) like AdminTools, biodata, BOE, dswsbobje…..
Admin needs to configure biprws.properties file . Copy the file: <INSTALLDIR>\SAP BusinessObjects Enterprise XI 4.0\warfiles\webapps \biprws\WEB-INF\config\default\biprws.properties to <INSTALLDIR>\SAP BusinessObjects Enterprise XI 4.0\warfiles\webapps \biprws\WEB-INF\config\custom\biprws.properties and then open it for editing. Modify the parameters as required and Restart Tomcat Server. Given below is a table describing the properties shown in the screenshot. The number of entries that will be listed per page. You can override this setting with the&pageSize=<m> parameter in the RESTful Web Services SDK. The expiry time a logon token will remain valid for. Beyond this time, you need to generate a new logon token. The number of cached sessions that can be stored at any point in time. The session pool caches active RESTful web service sessions so they can be reused when a user sends another request that uses the same logon token in the HTTP request header. The time in minutes after which the cached sessions will expire. Enables logging and sets the level of severity and detail to None (only critical eventslogged), Low (startup, shutdown, start and end request messages), Medium(error, warning and most status messages) or High (Nothing excluded. It is used for debugging only. The CPU usage may increase, thereby impacting performance). This setting is a menu that sets which query method will be used to retrieve trusted authentication logon tokens when using the RESTful web service API /logon/trusted. · HTTP_HEADER is used for GET queries with the request header accept=application/xml (or application/json). · QUERY_STRING is used to add a logon name to the end of a URL query using the RESTful Web Service API, for example /logon/trusted/?user=johndoe. · COOKIE is used when the login name is retreived from a web browser cookie. The domain, name, value and path must be stored in the cookie. The label used to identify the trusted user for the purposes of retrieving a logon token. The topic provides instructions to enable trusted authentication for RESTful web services on Tomcat application server. Generate a shared secret key. Refer to Generating a Shared Secret Value for more information. 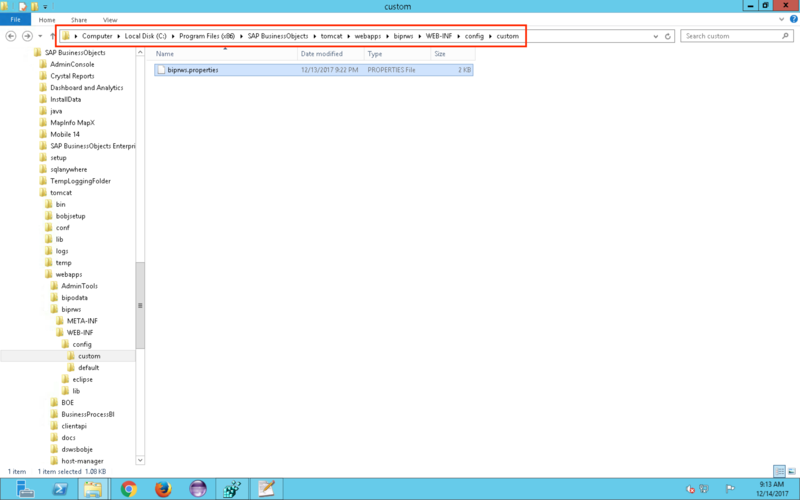 Save the shared secret key at <INSTALLDIR>\SAP BusinessObjects Enterprise XI 4.0\java\pjs\container\bin in Windows. Open the shared secret key in a text editor. Copy the shared secret key. 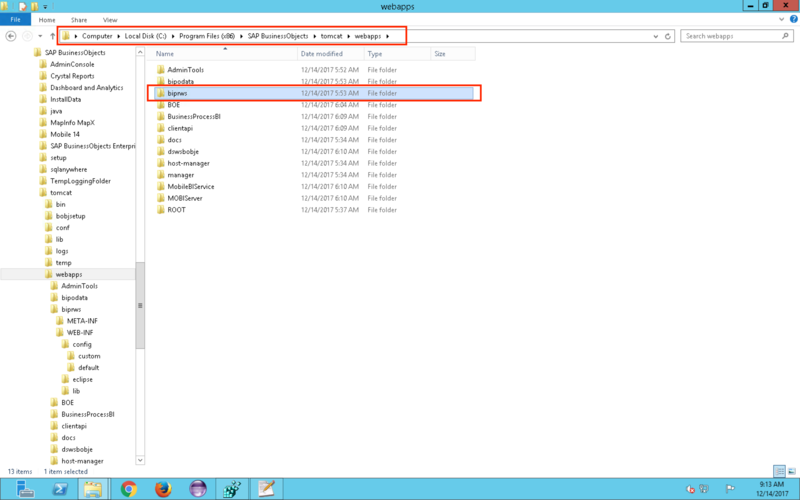 Copy the file <INSTALLDIR>\SAP BusinessObjects Enterprise XI 4.0\warfiles\webapps\biprws.properties to <INSTALLDIR>\SAP BusinessObjects Enterprise XI 4.0\warfiles\webapps \biprws\WEB-INF\config\custom\biprws.properties. Open the biprws.properties file in a text editor. Paste the shared secret key against the value Trusted_Auth_Shared_Secret=. Add the Retrieving Method and User Name Parameter. Refer the table above to add the Retrieving Method and User Name Parameter. In public key cryptography, X.509 is a standard that defines the requirements for a secure digital certificate. An X.509 certificate verifies the possession of the public key by a user or a services identity. Enable SSL on Tomcat. Refer to Configuring SSL on Tomcat for more information. Some client tools require authentication through RESTful web services. Follow these steps to enable single sign-on (SSO) for web services. 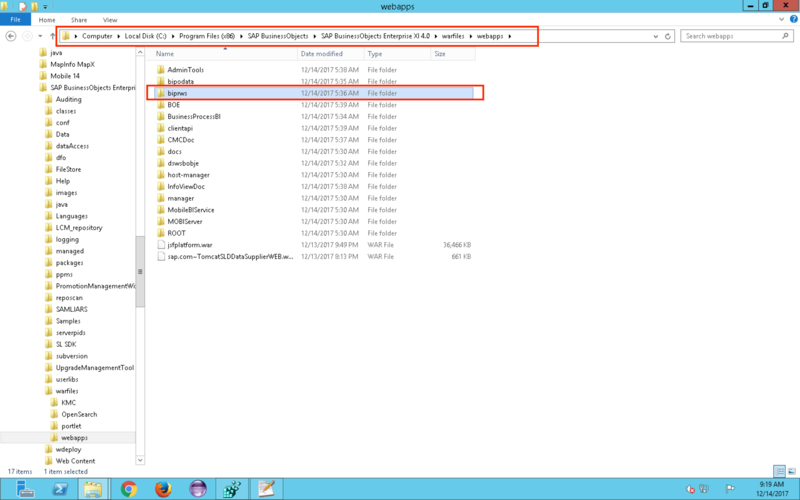 Copy the file <INSTALLDIR>\SAP BusinessObjects Enterprise XI 4.0\warfiles\webapps\biprws.properties to <INSTALLDIR>\SAP BusinessObjects Enterprise XI 4.0\warfiles\webapps \biprws\WEB-INF\config\custom\biprws.properties, and then open it for editing. To enable Kerberos SSO for Windows Active Directory (secWinAD) authentication, set sso.enabled to true. idm.realm (the same as the default_realm specified in the Krb5.ini file). idm.princ (the same as specified for idm.princ in the global.properties file located at<INSTALLDIR>\SAP BusinessObjects Enterprise XI 4.0\warfiles\webapps\BOE\WEB-INF\config\custom). idm.keytab (the same as specified for idm.keytab in the global.properties file located at <INSTALLDIR>\SAP BusinessObjects Enterprise XI 4.0\warfiles\webapps\BOE\WEB-INF\config\custom). Use WDeploy to redeploy the WAR file on the web application server. For information on using WDeploy, see the SAP BusinessObjects Business Intelligence Platform Web Application Deployment Guide . To test your settings, on the client machine, open any browser and launch the URL: http://<WebAppServer>:<portnumber>/biprws/v1/logon/adsso.The REST token must appear as a response to the API. Hence, we are unable to proceed further with rest of configuration steps. Could you help? Please share the BOE product version. War file is available from BOE 4.2 SP05. We are on BOE 4.2 SP03. Will deploy SP05 on Sandbox, update you. What’s the advantage of V1 – http://<host>:<port>/biprws/v1/ ? Check if the CMS machine host is reachable from web tier machine. If not, then make host entries of the machines and try again. I get a 404 Unable to access the current page when following the link to generate a new shared key. I am logged on using my OSS id, and haven’t had this happen before. Anyone else see this and is there something I may be doing wrong? If that’s not working, it can be found in the BI Platform Administrators guide on help.sap.com. Under Trusted Authentication, check the box against Trusted Authentication is enabled. Choose New Shared Secret. This will generate the shared secret key. Choose Download Shared Secret and then Update. Copy the downloaded file TrustedPrincipal.conf to <INSTALLDIR>\SAP BusinessObjects Enterprise XI 4.0\java\pjs\container\bin in Windows. For which page you are getting 404 error ? Any of the links in the main thread for “Generate a shared secret value”. I logon using my OSS id, which I use for everything in the SAP world, and it gives me that 403 error (my bad .. it was a 403 error, not 404 as originally posted). This link you are getting 403 ? You actually have to update the default biprws.properties file in addition to creating the custom biprws.properties file in order to get this to work. Check your TrustedPrincipal.conf file. The original one from our system (after upgrading from 4.2 SP5) appeared to have line-feed characters in it so it didn’t work. I had to re-generate the Shared Secret in order to get this to work. In addition to putting the TrustedPrincipal.conf file in the folder indicated above, also put it in the w64_x64 folder. I m tryig to make a secure connection to Fiori Laucnhpad. But i get restful service error. Does it support ssl on webshere or not? I couldnt find any post about that. which URL it is pointing to and check the URL is responding. In WACS we can enable an error stack trace for REST. How is this done in Tomcat?